SCOTLAND’S green energy strategy has taken another step forward with Scottish Government approval for two wind farms in South Ayrshire capable of generating electricity for 117,000 homes. The 60 turbine, 180 Megawatt (MW) Arecleoch wind farm near Barrhill in South Ayrshire - set to be Scotland's fourth largest - will generate enough electricity for 76,000 homes. 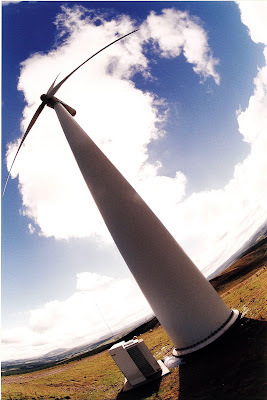 The 28 turbine, 84 MW Mark Hill wind farm also in South Ayrshire will generate electricity for 41,000 homes. These projects will make a significant contribution to the Scottish Government’s target of 31 per cent of electricity from renewables by 2011. 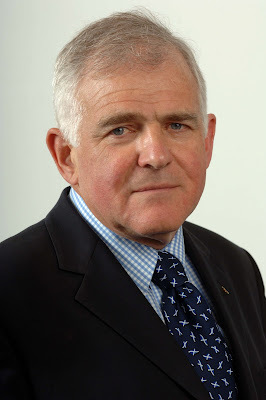 Energy Minister Jim Mather (pictured above) said: “The Scottish Government's approval for two more wind farms is a significant step in our drive to turn Scotland into the green energy capital of Europe. “Scotland has a vast array of potentially cheap, renewable energy sources, from our waters, our waves and our wind. And we are turning that potential into a reality with a progressive and distinct approach to make renewables a driver of sustainable economic growth. The Scottish Government has set a target to produce 31 per cent of electricity demand from renewable sources by 2011, and 50 per cent by 2020. Any proposal to construct, extend or operate an onshore wind farm in Scotland with a generation capacity in excess of 50 MW requires the consent of Scottish Ministers under Section 36 of the Electricity Act 1989. The Scottish Government’s Energy Consents Unit is currently processing 35 renewable project applications - 26 wind farms, eight hydro projects and one wave project. Current installed renewables capacity is 2.8 Gigawatts (GW). One GW of renewable capacity is currently under construction. Current renewable applications to Ministers under section 36 of the Electricity Act amount to 3.3 GW, which, in line with processes for environmental assessment, public consultation and where appropriate public local inquiry, are all at various stages of the consents process and still to be determined. The Energy Consents Unit has also provided pre-application scoping opinions for a further 1.7 GW of potential renewable development. Sixteen energy projects have now been determined by this Scottish Government. This includes consent for Scotland’s second largest wind farm in Dumfries and Galloway, and Scotland's third largest wind farm in Perthshire. * Electricity generated by renewable sources (apart from hydro natural flow) increased by 46 per cent. * In 2006, Scotland could have supplied 92.5 per cent of its electricity needs from non-nuclear sources. * As a result of unplanned outages, nuclear’s share of generation fell from 38 per cent to 26 per cent in Scotland. There are currently 276 Ayrshire business stories permanently archived on this site. To locate those of most interest to you, please use the site search facility in the top left hand corner of this page. Type your search term in the white box, then click “SEARCH BLOG”.